I've been seeing more and more beers from New Zealand in the market lately... and this is probably a good thing. It's tough for Louisiana to get better domestic craft brews due to distribution and licensing issues, but it seems to be easier to get more and more imports in. 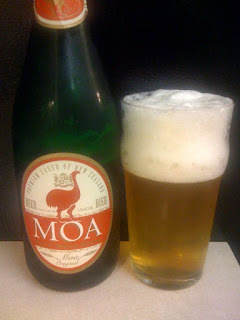 From a previous beer from New Zealand, the Moa Tripel, to Cucapa craft beer from Mexico there has been an influx lately. I've even seen a few 6-packs from New Zealand on the shelves in Bet-R, but haven't picked any up yet. I'm especially excited to see more beers from the Kiwi nation popping up, as everything I've read tells me that they have a serious emerging craft beer scene on their hands. I even focused on their craft beer scene in my World Cup posts, and a recent episode of Brewmasters involved Sam from Dogfish Head traveling to New Zealand to participate in their largest beer festival. I've been meaning to write about the show, but I guess I'll save that for a later date. For now... here's the Moa Original, one of the flagship brews of the Moa Brewery. First thing to notice, this guy comes 750ml at a time... but don't worry, it's an easy drinking pilsner and with the help of a friend (or not) one bottle should go fairly quick. It has the typical pilsner look to it, and a very typical pilsner aroma of earthy tones with a hint of hops. The flavor remained true to the style as well although I think it could use more hop profile. An easy drinker for sure to sit back with and watch a game, although I think I like their tripel better in terms of overall quality.